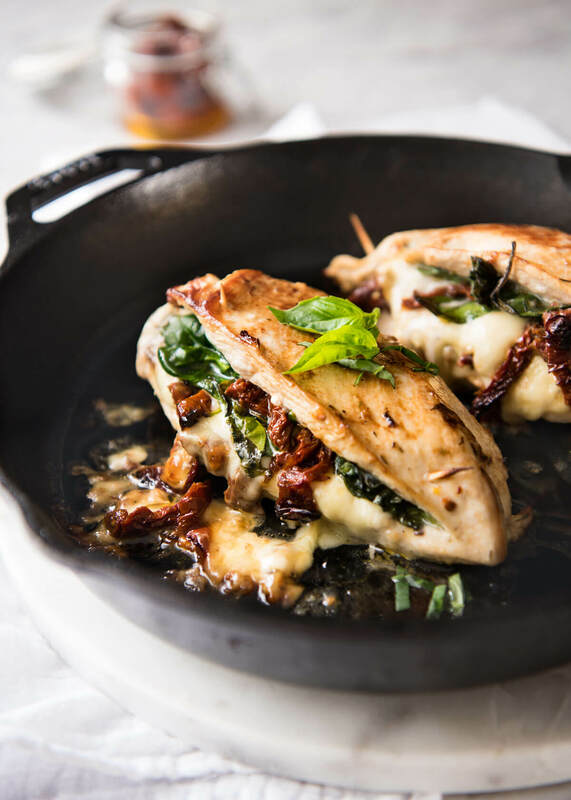 If you’re searching for the best griddle recipes, then you came to the right place! We cover a wide range of griddles and review all kinds of griddles to see which are the best. The griddle has a long history and has been used by nearly all cultures to cook food. Primitive griddles were made from clay slabs, stone and brick, eventually evolving into the large stainless steel or aluminum griddles you see today. 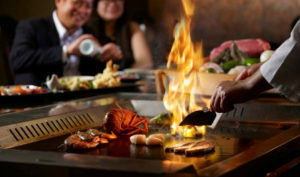 Especially popular in Asian cuisine, the Teppanyaki is a large surface griddle which has become very popular in fast food establishments such as McDonald’s and local diners for cooking hamburgers and pancakes. It wasn’t until the 1960’s that the non-stick teflon coated electric griddle hit the consumer market and it became very popular in a short time. Many people had tasted the delicious hamburgers and pancakes from their local diners that were cooked using a large griddle. 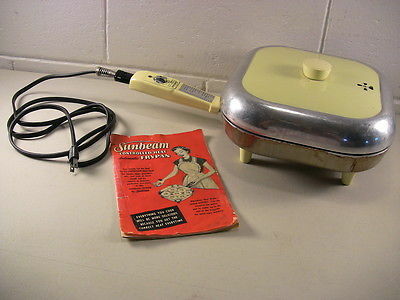 They wanted to bring that same flavor to their kitchen and using the portable electric griddle they could now do that. There are many different varieties of griddles to hit the market in the past several decades and here we will take a look at all of the popular different styles of griddles. We’ll review the pros and cons of each griddle and help you find the best style of griddle for you home cooking. 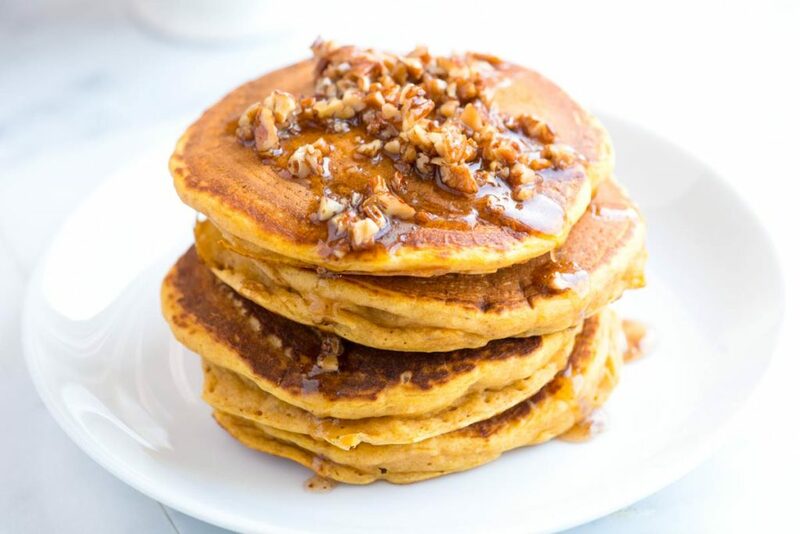 You will also learn recipes designed specifically for cooking on griddles, which give food a unique taste that can’t be found elsewhere. There are several things you want to look for when buying a new cast iron griddle. 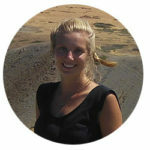 In our buyers guide we will cover everything you need to look for. 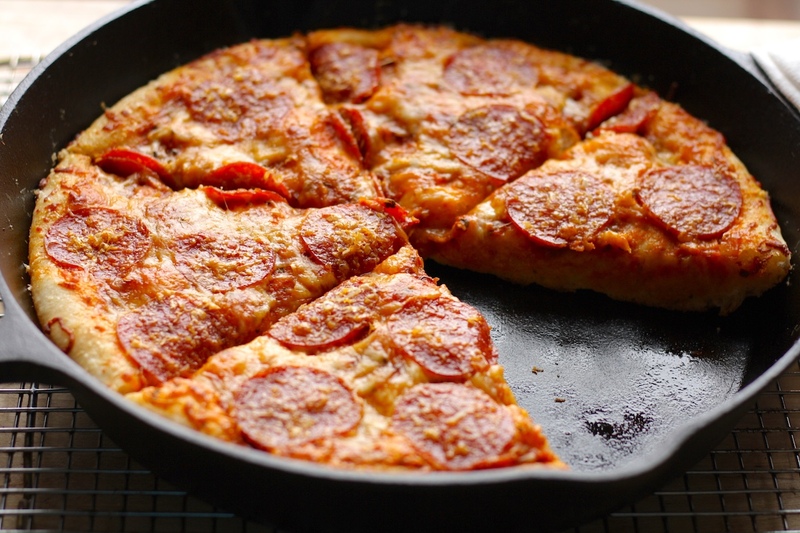 Plus we show you basic do’s and dont's when it comes to cooking with your cast iron griddle. Cast Iron pots and pans have a very old history and many of the top brands have been making them for hundreds of years. You won’t have much difficulty choosing a cast iron griddle as they all seem to be very similar. You can find some with rubber handles like the Lodge Cast Iron Skillet, which is great because you won’t burn yourself on the handle, which I have done several times. As you can see there are not many cons when it comes to good old cast iron. Personally, I believe that cast iron is the best griddle material due to the flavor you get with it. The biggest con for me is that they are heavy but personally like them better than all other types of metals. My grandmother had a cast iron skillet that her grandmother gave to her and it has to be almost 200 years old and looks like it’s new. If you take care of your cast iron griddle it will last for centuries. The most difficult thing about cast iron is learning how to cook with it but when you learn how it will be your favorite. Many people have the misunderstanding that using cast iron may not be as sanitary as other pans because you don’t wash them the same way. I can assure you that this isn’t the case. 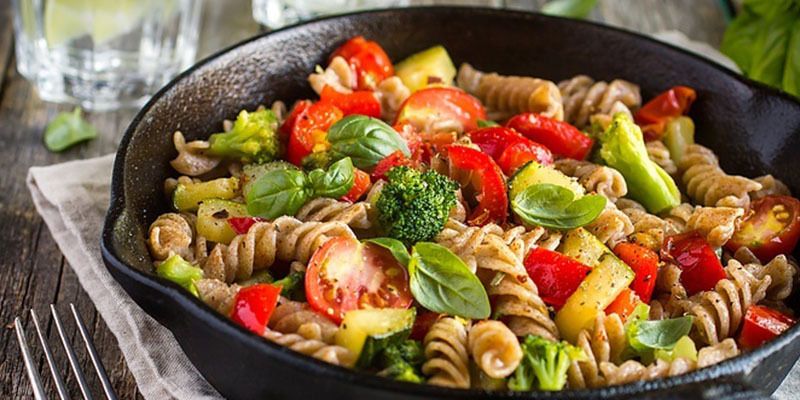 Before you begin cooking on a cast iron skillet you should oil the pan lightly with a few drops of your favorite oil. Heavy duty stainless steel surface allows you to cook over a fire or gas grill and not worry about having food drop off or into the grill. Lasts for hundreds of years if you take care of it properly. One of the healthiest metals to cook your food on. Like all metal in can rust if not taken care of and washed properly. Heavier than all other cookware. Can break if you drop them or heat them up too high. Food will stick to the griddle if you don’t add oil or butter. We review the top cast iron griddles in 2017 and explore what makes them so good. Learn how to avoid common mistakes that can ruin your cast iron griddle. For several years I have been cooking with a cast iron griddle and I love it. The old ways are often best when it comes to cooking and cast iron gives you a flavor that you just can’t get any other way. For anyone that hasn’t cooked with cast iron cookware, you don’t need a lot of heat to use them. When placed on a stove top the heat is evenly dispersed and your food ends up perfect just about every time. 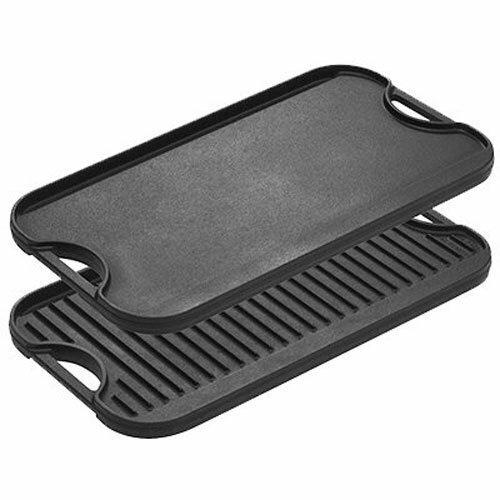 A griddle differs from other cookware in that you don’t move it around while cooking. It sits flat on the stove top and doesn’t require you do too much else, except control the temperature and use a spatula. If you often find yourself multitasking in the kitchen then a cast iron griddle is ideal and will save you plenty of time. Your griddle needs to be hot before putting your food in it. If the pan is not hot the food will stick. You must be patient when heating up your cast iron griddle because it can take several minutes to heat up since the surface area is open and exposed to air. After it’s hot I like to put a small amount of butter on it and it will instantly melt. Now, you are ready to put any food on it and it will not stick. 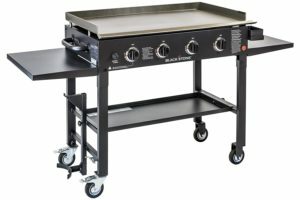 Choosing the best electric griddle can be a difficult task. There are hundreds to choose from and many different name brands. 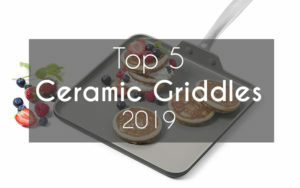 Some are better than others and in our electric griddle buyer’s guide you’ll see the reviews for the top rated electric griddles to help you decide. The surface area of the electric griddle is larger than that of other griddles. This means you can cook a variety of foods at the same time, unlike a pan where you can only cook small dishes. 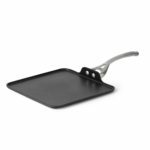 Ideal for quesadillas, sandwiches, steaks, pancakes and much more, the flat surface makes it easy to use a spatula for flipping foods quickly. 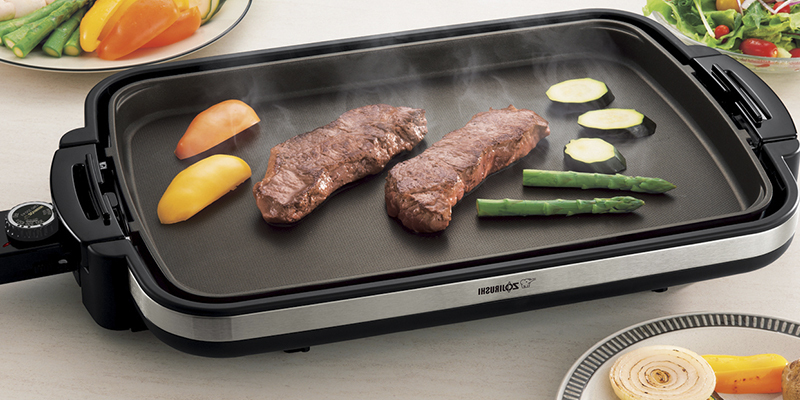 Heat is evenly distributed on the electric griddle making it perfect to evenly cook your food. Unlike a stovetop griddle which will use the heat of a gas burner below it, where the heat will be focused on the center of the griddle. Electric griddles free up other cooking equipment, such as stove tops and the stove. By using an electric griddle on your counter top you are free to use the stove to cook something else. One other great thing you can do is use your electric griddle to keep your food warm. One great idea that I’ve done is to elevate your griddle and use the space under it to keep your food warm. The variety of foods you can make on an electric griddle is endless. You can use the grease traps to collects grease from meats and re-use it. This is very difficult with a standard skillet. 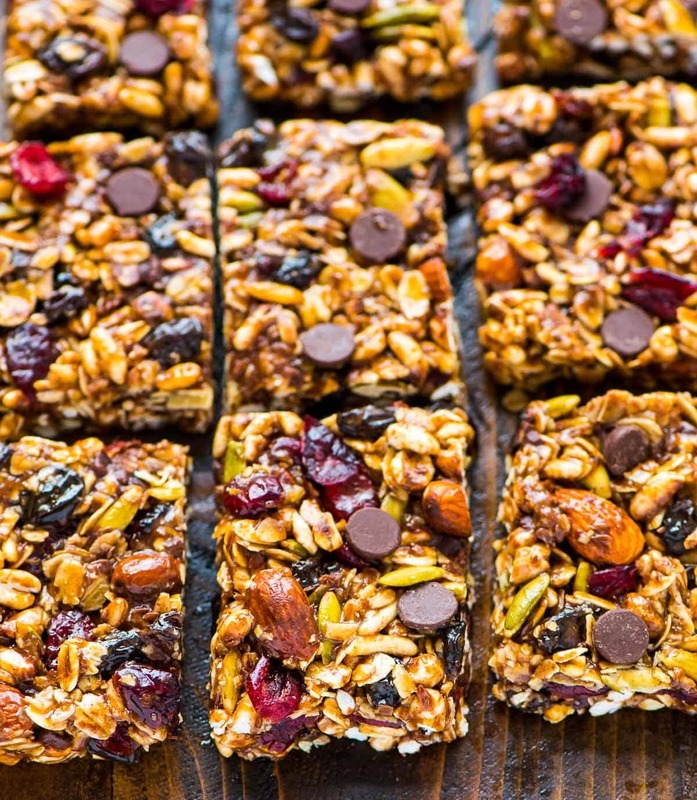 The variety of different foods you can make on an electric griddle are endless and that’s why it’s become such a popular feature in most households. Most people when they see an electric griddle think that it can only be used for cooking breakfast, this is certainly not the case. One of the most popular things to make with an electric griddle is quesadillas. Heats in a uniform pattern due to the built in electric heating element. Easy to connect cord with adjustable heat settings. 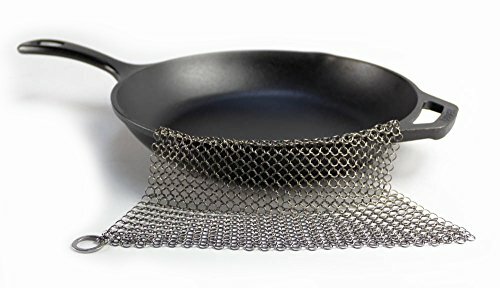 Very easy to clean and has a large area for cooking food. While being small enough to fit into a kitchen cabinet when you’re done using it. Many times I have had trouble with the short cord length. Although a short extension cord can remedy this. The grease trays can be difficult to clean. Grease trays can tend to be too small as well. Some electric griddles are difficult to clean the surfaces. Heating element may be poorly designed and cook food unevenly. In our electric griddle buyer’s guide you’ll learn what to look for and what to avoid. We review the best large electric griddles, small griddles, electric griddle pans and more! The large surface makes it perfect to make several pancakes at once. The next most popular cooking idea is bacon! Cooking bacon can be difficult because normally the grease stays in the pan and the bacon becomes soggy. With an electric griddle the grease goes into the plastic tray and you can get a nice crispy bacon that is hard to get any other way. Basically the electric griddle is a large cooking surface that’s perfect for many different foods. Personally, my favorite is hasbrowns, which are difficult to cook in a skillet due to the smaller size. If you have a large family then a large griddle can accommodate several grilled cheese sandwiches at once, saving you a lot of time. One of the things many people don’t consider is that the electricity used is very little when operating an electric griddle. The cost you using electricity as opposed to gas can save your family hundreds of dollars a year. 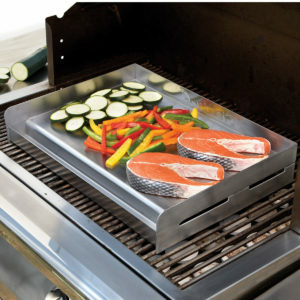 The Outdoor Griddle is ideal for using along with your grill. You can take with you to an outdoor event and place it on the grill and you’re ready to go. The great thing about the Outdoor Griddle is that you can cook eggs on your grill. You can cook many other different foods and you get the best griddle experience possible from cooking with friends and family. 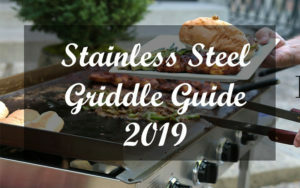 To learn how to find the best outdoor griddle be sure to take a look at our full buyers guide. We review all of the top Outdoor Griddles currently on the market and show you what to look for and what to avoid. The flavor of the outdoor griddle is comparable to that of a grill since you get that wonderful smoked flavor. 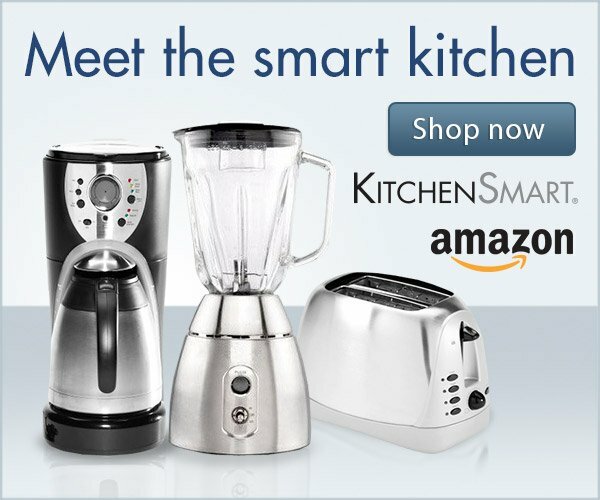 It’s perfect for cooking meats such as steaks and chicken, eggs, vegetables, and much more. 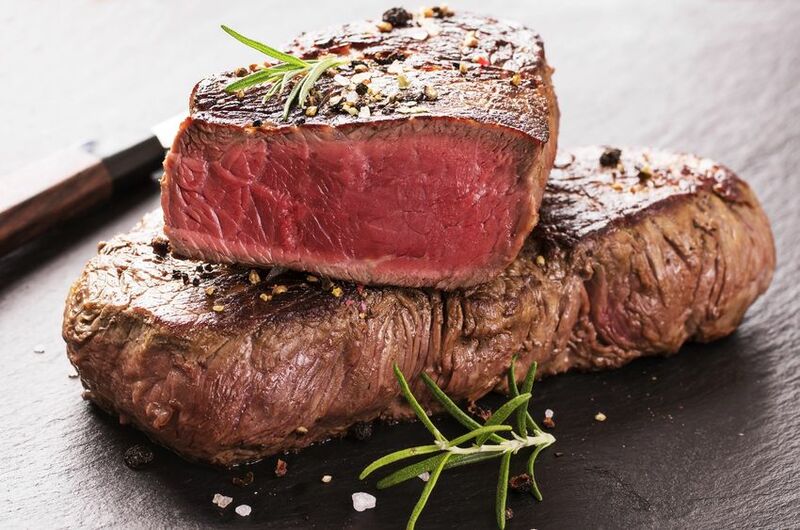 Since the surface is flat and the food is always in contact with the surface, it requires you to pay more attention when cooking and use a spatula to turn the food more frequently to prevent it from being burnt. The portable outdoor griddle is made of Stainless Steel or Ceramic and designed to fit almost any gas grill. 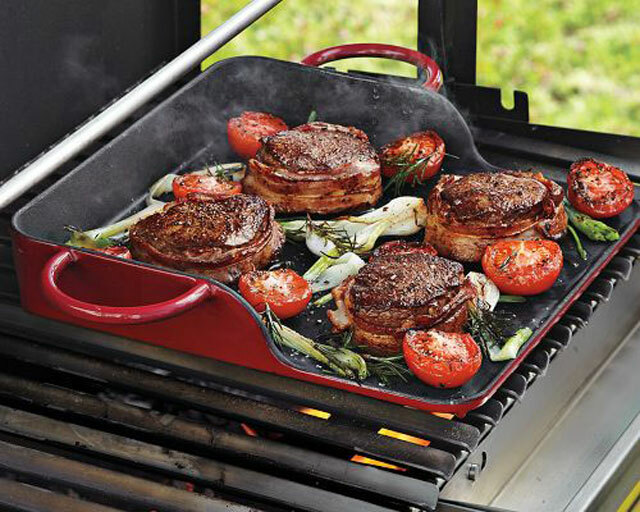 If you enjoy cooking on a grill and haven’t tried using an outdoor griddle, you are missing out! Cooking on an outdoor griddle is pretty similar to cooking on a grill, except that the surface is flat. 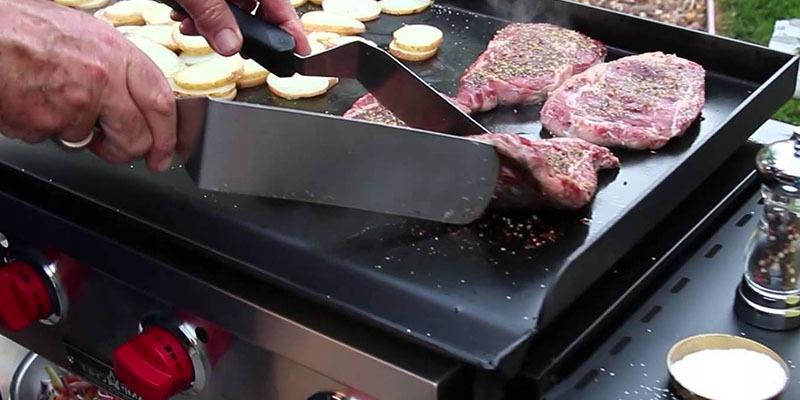 You don’t need to worry about the outdoor griddle warping from high heat. 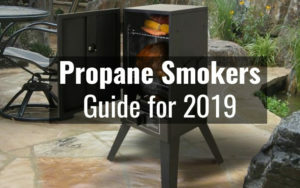 Most of them can handle 12,000 BTU+ which is hotter than most standard grills get. Cleaning is simple and very similar to any other griddle. Since the outdoor griddle is made of stainless steel you simply need to use a wire brush to scrape off anything and then wipe it down with a cloth dipped in a little out. This will prevent it from rusting when it’s stored away. Heavy duty stainless steel surface allows you to cook over a gas grill and not worry about having food drop off or into the grill. 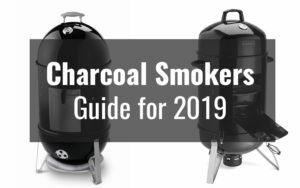 Fits most standard gas grills, but double check the size before buying one. 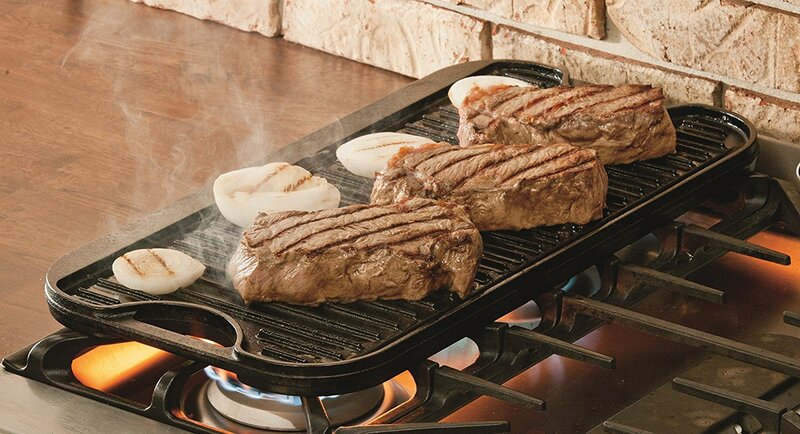 Drip tray allows you to collect grease off of your grill, rather than having it fall into the grill or stick to it. Clean up is easier than cleaning a grill. Oil can get caught in the sides and is difficult to remove. Most outdoor griddles don’t have handles so be careful when removing it from the grill. Grease can collect on the surface and if you’re not careful and can jump off the surface onto your clothes or skin. Some stainless steel griddles will rust if not properly cleaned after use. Find out why outdoor griddles are becoming so popular! 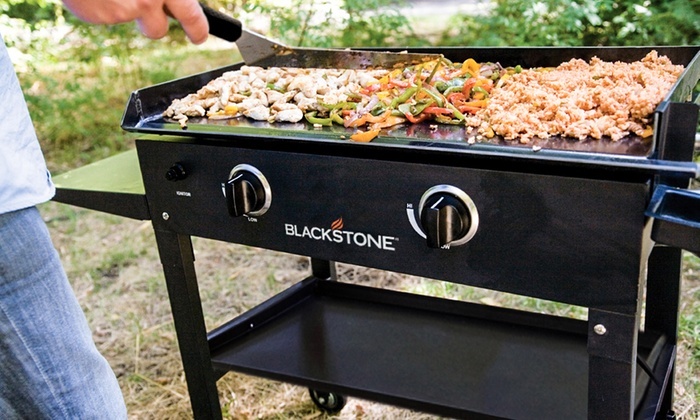 We’ll show you how to find the best outdoor griddle to use for your home grill. We also look at the best propane powered outdoor griddles in action. One other thing I should mention is that the outdoor griddle is perfect for cooking pizza on your grill. Normally you wouldn’t try to cook a pizza on your grill but ever since I have been making pizzas on my stainless steel outdoor grills people can’t believe the flavor. One of my other favorite things to make is stir-fry’s, omelets, fajitas, and full breakfasts with eggs, pancakes, and bacon. The great thing about cooking outdoors is that your house won’t smell like food when you’re done cooking. This has been a problem with my house when cooking on a stovetop griddle, as the smell of sizzled chicken will linger throughout the house for quite a while. By using an outdoor griddle you can turn your grill into an outdoor kitchen. You are able to cook foods that you normally can’t cook on a grill such as eggs, pancakes or sliced potatoes. It really does extend the possibilities and if you are serious about cooking on the grill then getting an outdoor griddle is necessary. Since I have begun using one several years ago, I can’t imagine grilling without it. After reviewing many different griddle pans I was shocked to see that many of them burn and warp. Personally, I have never experienced this but if you want to avoid this problem then read out full buyers guide. We discuss how to prevent your griddle from burning and warping and much more. The majority of griddle pans are the non-stick variety, however many are also cast iron. 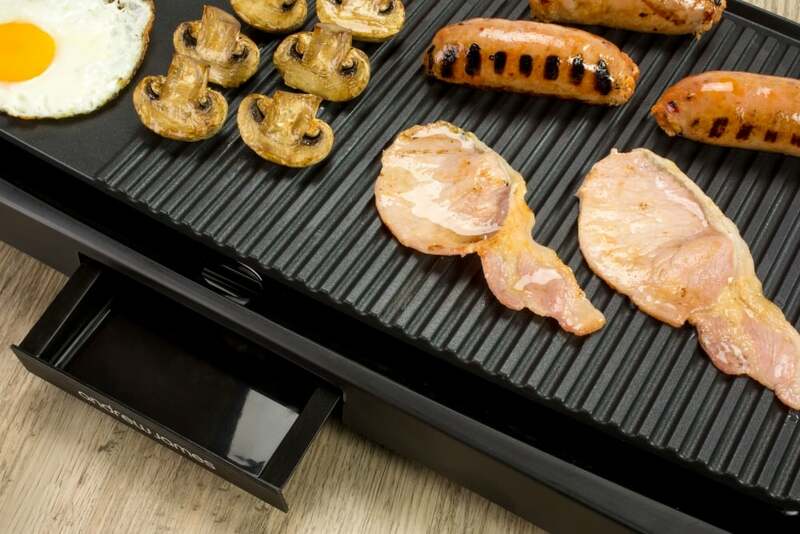 Here, we will be taking a look at the non-stick griddle pans which are a popular option for many homeowners and for good reason. 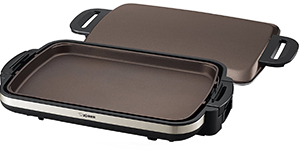 Nonstick cookware has become very popular lately and the nonstick griddle is no exception. 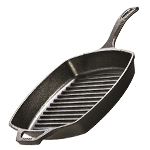 Similar to a skillet the griddle pan is made of similar material, usually hard-anodized aluminum. The different between griddle pans and skillets is that griddles are flat whereas most skillets are curved. 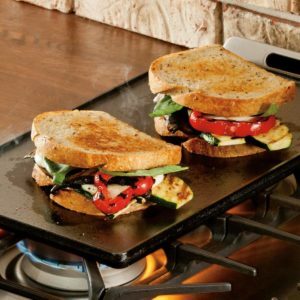 When looking for the best griddle pan you will find many different nonstick surfaces. 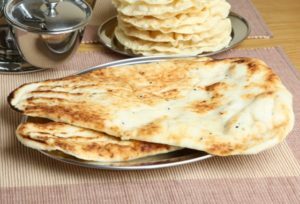 Each surface can affect the flavor of the food, heat consistency and cooking time. 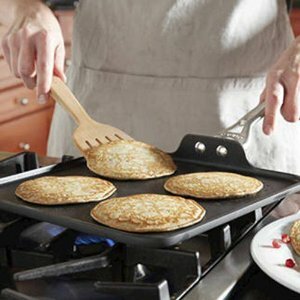 By spending a little time to study the different styles of griddle pans you can save yourself plenty of headaches. 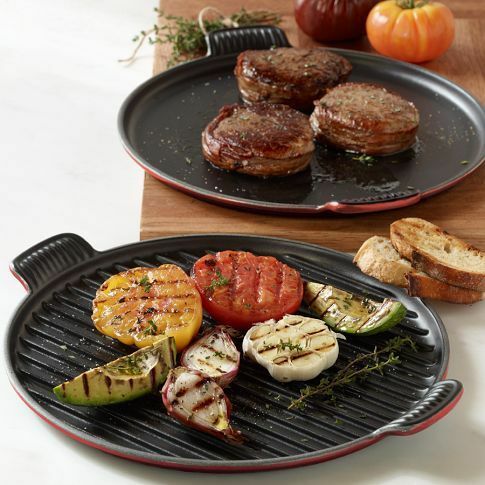 The nonstick griddle pan allows you to use less butter or oil when cooking because the food won’t stick to the surface. This is one of my favorite parts of this griddle. When cooking many foods such as pancakes, you usually need to use oil or it will stick to the pan. With a nonstick griddle pan you don’t need to worry about that. Heating it up too much can cause the metal to warp and then it won’t sit flat on your stove top anymore. Find the Perfect Nonstick Griddle. Not all nonstick griddles are created equal. 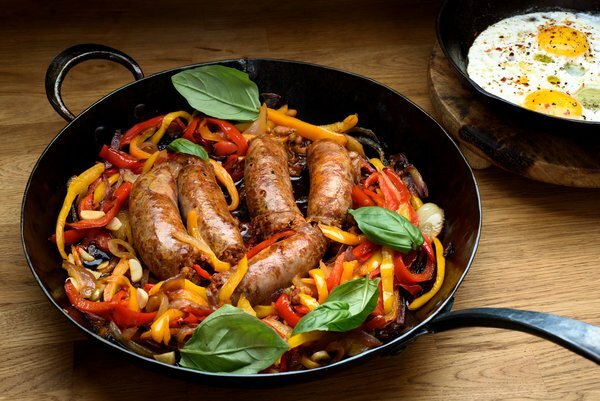 After reviewing over 20 nonstick skillets we have learned what to look for and what to avoid. Many people don’t like the nonstick griddles as much as cast iron or electric griddles. 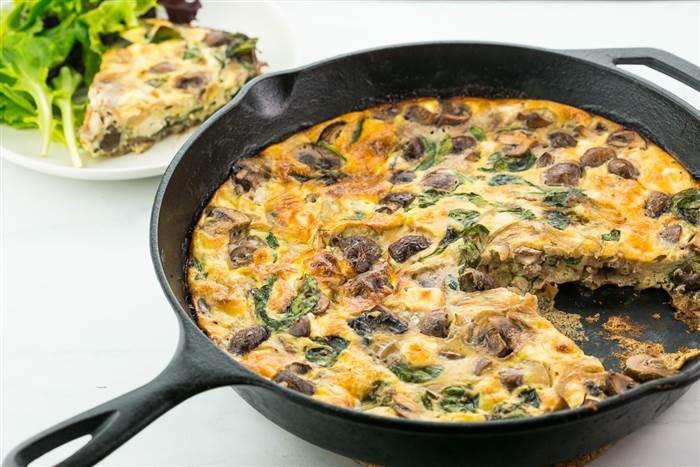 There are several things you need to watch out for when buying a new nonstick griddle pan and several things you need to look out for when cooking with it. 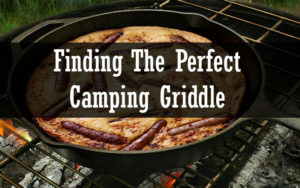 Finding a quality griddle pan can be tricky and there are several things you want to look. The first thing is the ridges. You will find that some griddle pans don’t have ridges and some do. These ridges help when cooking steak and fish to give it that nice chargrilled pattern. Picking the right size can also be a challenge. Many come in a usual size that will fit most conventional stove tops. Nevertheless, some are larger and some are smaller. In our review, we tried picking nonstick griddle pans that can apply to all stove tops without a dilemma. Stovetop griddles come in a variety of different shapes and sizes, as well as materials. 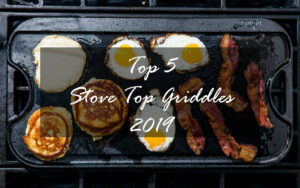 In our full buyer’s guide you’ll learn everything you need to about stovetop griddles to help you find the best one for you. Stovetop griddles are designed to cook a large amount of food in a short amount of time. There are two popular styles of stovetop griddles, cast iron and non-stick. 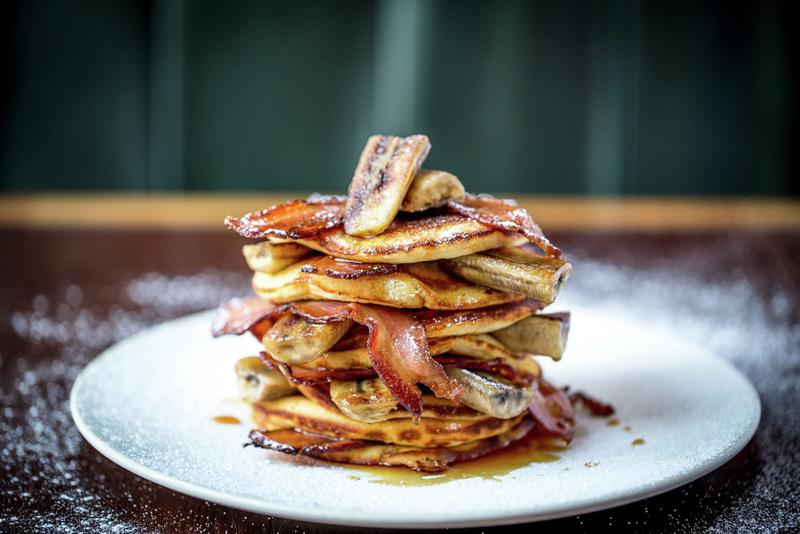 The nonstick griddles can be made from a variety of different materials and we till take a look at the different types, as well as the cast iron. The stovetop griddle is very old and dates back thousands of years. It has been one of the most popular methods of cooking food, although usually used over a fire. A stovetop is simply a more concentrated fire and placing your griddle on the stovetop will heat up the entire surface and you can cook whatever you want on it. The large surface area of the 2-burner stovetop griddle means that food may cook a little slower. The larger the exposed surface area, the more heat will escape and the longer the food will take to cook. One complaint I hear from people is that food may fall off the sides of the griddle. If you don’t want your food to fall off then use a skillet with a lid on it. Stovetop Griddles are designed to be flat and certain foods are meant to be cooked on a flat surface and many foods are not. When cleaning your stovetop griddle, be sure to do it when it’s still hot. Simply run water over it and use a spatula to scrape off anything that’s stuck to it. You should avoid using too much soap, as this can cause rust. What I like to do is use a cloth dipped in olive oil to clean my griddle after I am finished using it. This helps prevent rust buildup. Perfect for cooking larger meals for a family or several people. Since the stovetop griddle uses two burners you can cook more food than a regular griddle. Anodized aluminum stovetop griddles heat up the quickest, meaning you can cook your food faster than any other type of griddles. Very easy to clean your stovetop griddle when you’re done using it. Handles on the sides make it easy to pick up and move to courntertop or table when you’re done cooking. 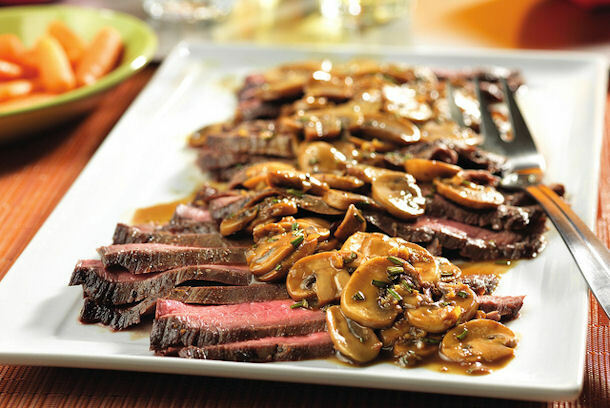 Can be placed on an outdoor grill or in an oven. Very strong metal means that it won’t get damaged easily and can last for decades without being replaced. Perfect for cooking on a campfire. If you do not take good care of your stovetop griddle it can rust. Can be overly large and very heavy. Food can stick to the surface. More expensive than other styles of griddles. Food can fall off the sides of the griddle spilling onto the stove. Looking for the Best Stove Top Griddle? We take a look at the best stovetop skillets to see which are the highest quality. We found that some are much better than others. Foods that are meant to be cooked on a stovetop griddle include eggs, pancakes, meats, fish, vegetables, and sandwiches. 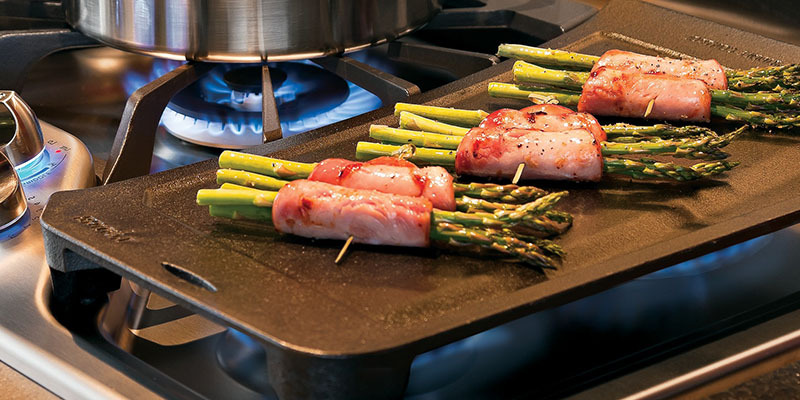 Foods that require a spatula and must be tended to quickly should be cooked using a stovetop griddle. 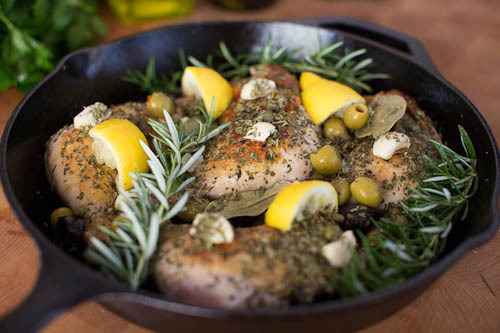 Slow cooking foods can be placed in a skillet where they can be allowed to steam. Also, foods that produce a lot of greases should be cooked in a skillet, such as bacon. Skillets are made with taller sides, this holds in the grease and water. You will notice that the hat is pretty evenly distributed through cast iron stovetop griddles. The heat comes from the center on the burner beneath it and the center of the griddle is the first to get hot. Therefore, you should always put the slowest cooking foods in the center of your griddle, since they will cook the fastest. It’s important to heat up your foods evenly and therefore place foods that cook more slowly on the other edges of the griddle, further from the center. As you can see there are many different styles of griddles to choose from. I’m hoping that you learned a little bit about each different type. It can be a bit overwhelming at first to look at all the different types of griddles and not know which one you should use. Each type of griddle has its own purpose and if you want to cook some truly amazing food, then you should think about getting a griddle of each variety. When looking into a specific griddle be sure to take in account how large it is, the price, quality, reviews and flavor. 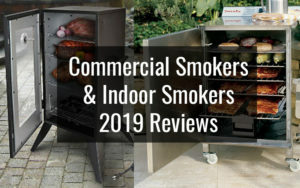 Whether it’s an electric griddle or an outdoor griddle, you want to learn as much as possible about it before buying it. Then, you need to spend even more time after that learning how to use it. Most of these griddles are simple to use and act just like a regular grill or pan, so I don’t think you’ll have much trouble using them. It’s very important to take better care of your griddles than most other cookware. They can rust easily if you don’t take care of them and maintaining them is pretty simple. 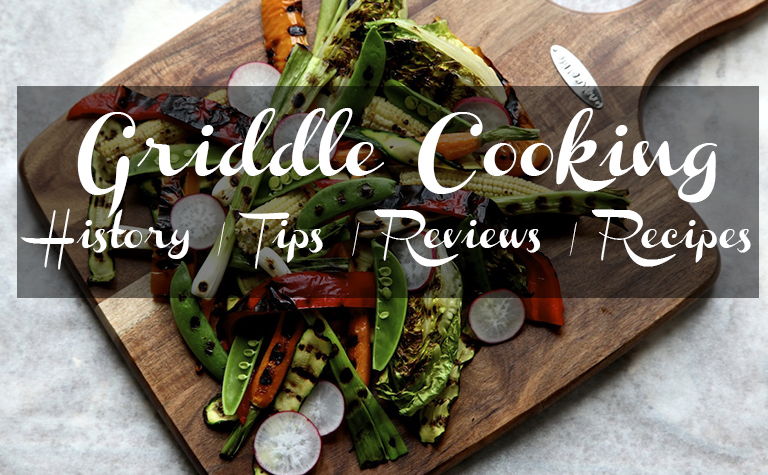 At the end of each buyers guide I talk about simple tips to care for each different style of griddle. Since many of them are made of cast iron or steel, you don’t need to use much soap or they will rust. Also, I go over the tools you need to become a master of the griddle. Be sure to check out the different types of oils you should use as well. Different cooking surfaces need different oils to work best. This is usually perfected by experimentation. For years I have preferred the griddle over the grill. 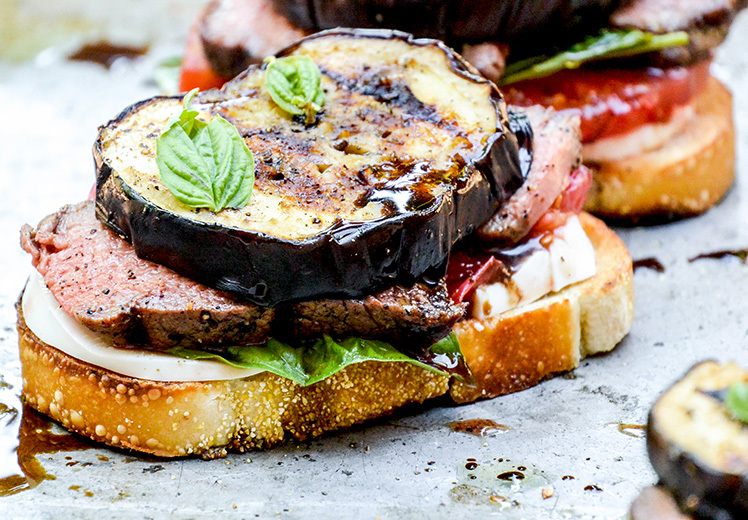 Most people have grills and it’s easy to cook on the grill and doesn’t require much work. You simply throw your food on the grill and wait for it to cook. A griddle on the other hand needs more skill in preparing and cooking the food. 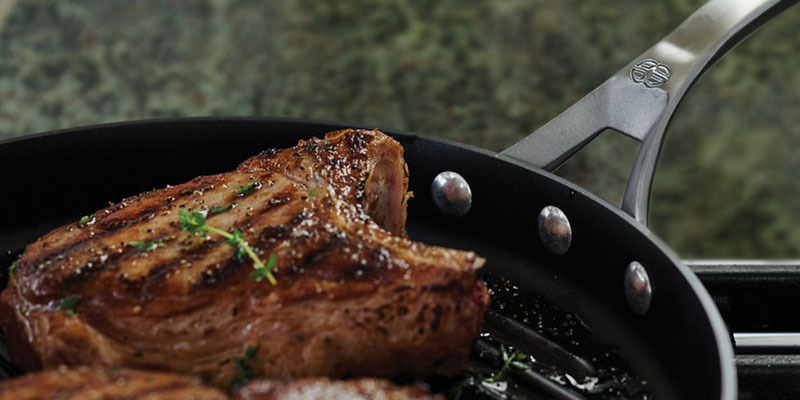 You’re rewarded with more flavor and more enjoyable cooking experience when using a griddle. 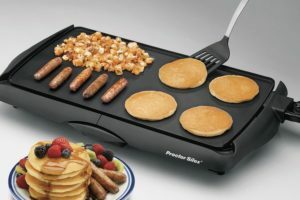 The only question then becomes which type of griddle to get? Well, that’s up to you and most of the recipes on this site can be cooked with any style of griddle.